I don’t know if you have a husband who is a hunter, but I do. I didn’t know that when I met him, but last year he started going hunting with my dad way up north in the Upper Peninsula. Last year, while he was gone, I repainted the kitchen and kitchen cabinets. 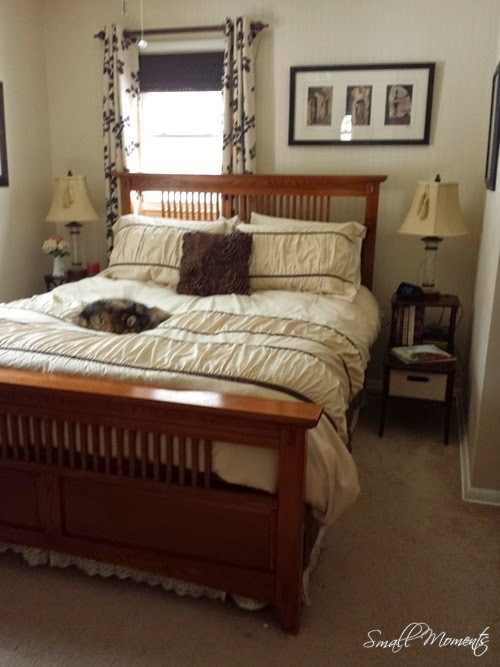 This year, I redecorated our bedroom. He gets to have his fun, and I get to have mine! 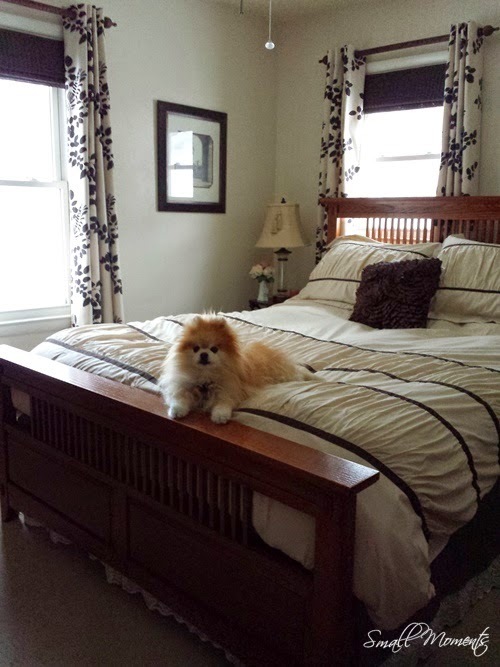 Tia likes the new bedroom decor! 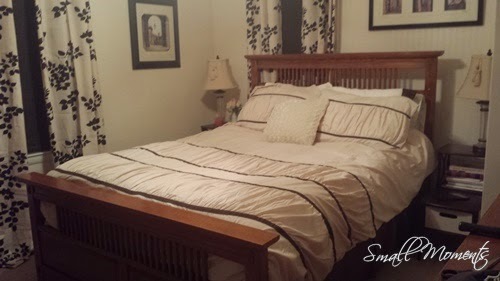 Since I moved into Jim’s house back in 2009, I have been at a loss what to do to make our bedroom feel like a retreat. Our bedroom is small. 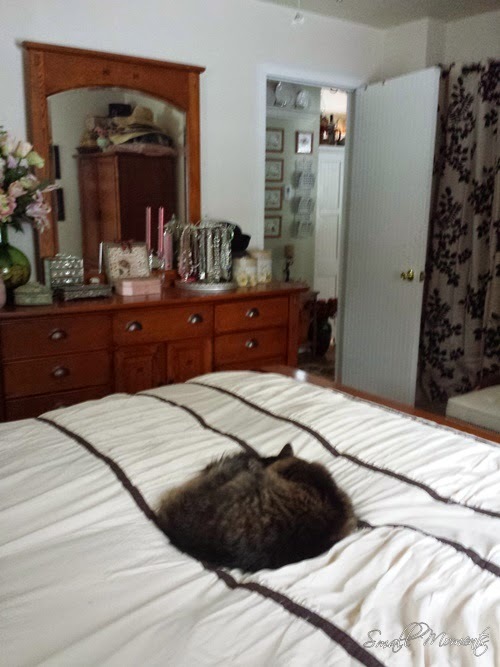 So small, that there is only one place that our queen size bed will fit. Unfortunately, the wall where it has to go has one off-center window. The off-center window has always bothered me. I mean, what was the builder thinking when he put a single window off center on the wall. It’s not like centering it would have ruined the look of the house from the outside. Anyway, I’ve tried to camouflage it with curtains, but have never really been happy with the results. As you can see, it really closed the room in and made it feel dark. Embracing the off-center window seemed like the best thing to do in this situation. 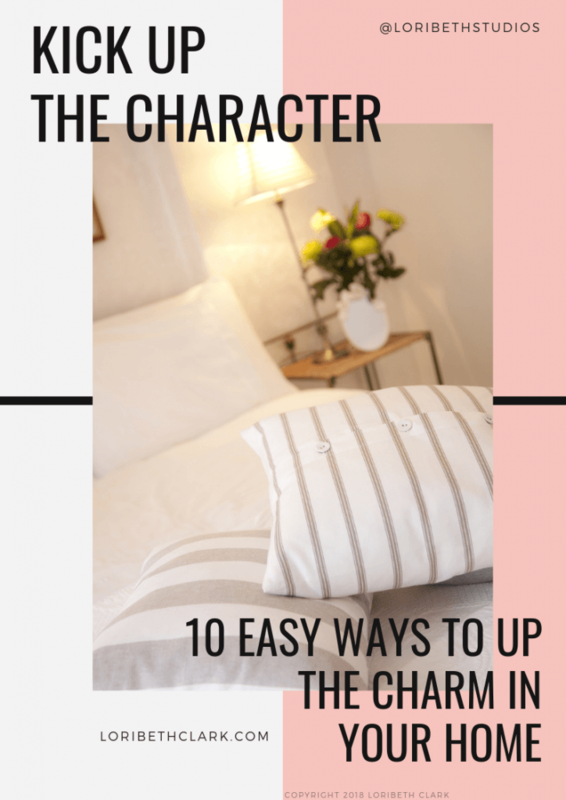 All over the internet, I found pictures of camouflaging the off-center windows, but not one of how to decorate without trying to camouflage it. Personally, I’m thrilled with how it turned out. It gave me space for some great art above the bed, which I couldn’t have done with curtains. Jasper seems to like it too. Since I decided to embrace the off-center window rather than trying to hide it, I decided to wallpaper the wall behind the bed to give it some texture. The wall had to be special if I wasn’t going to hide it. 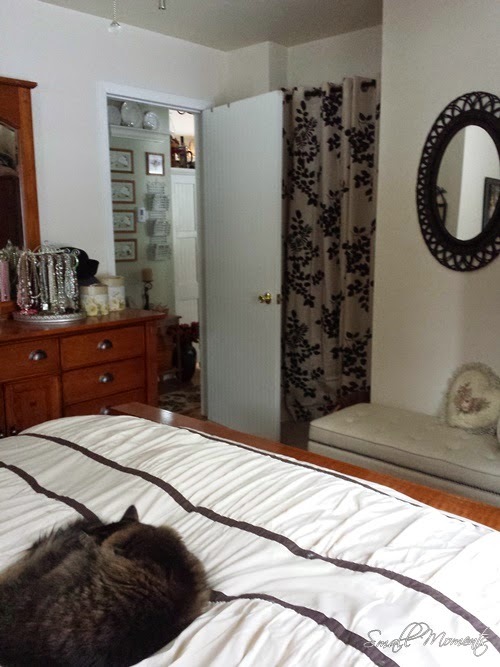 But I didn’t want a feature wall, I still wanted it to blend in, so it was painted the color of the rest of the room. 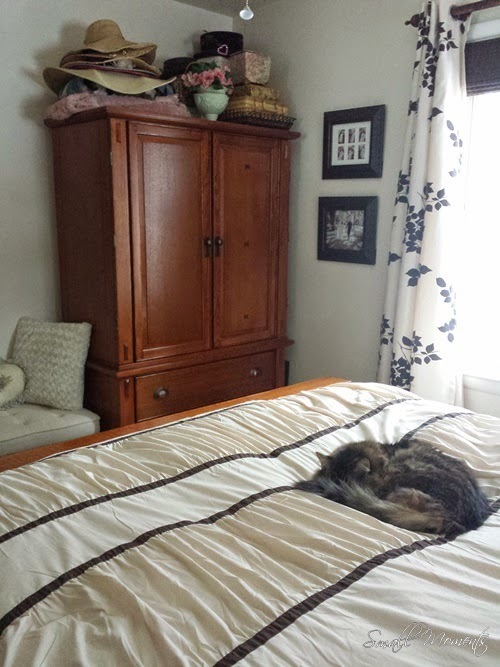 I used the paintable, beadboard wallpaper that I used on my kitchen cabinet doors. The paint color was one thing that definitely had to change in the room. I don’t know what the old color was, but it had a yellow tinge to it that made me think of nicotine stains, and it always felt dirty to me. Painting the walls Valspar’s Pantone White Asparagus freshened up the room. Even though the new color was similar to the old color, it looks clean, and clean always feels brighter. Wallpapering and painting behind the bed. The other thing that had to go was the nightstands. 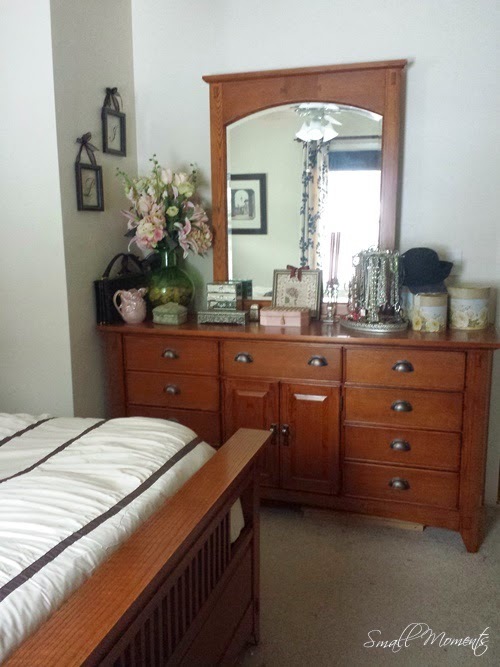 Our old nightstands were so big, the drawers had to face in towards the bed in order for them to fit on both sides of the bed. For $50, I found a great vintage pair of end tables on Craigslist. I bought two Allen and Roth storage boxes for the bottom shelves of them that work like drawers. 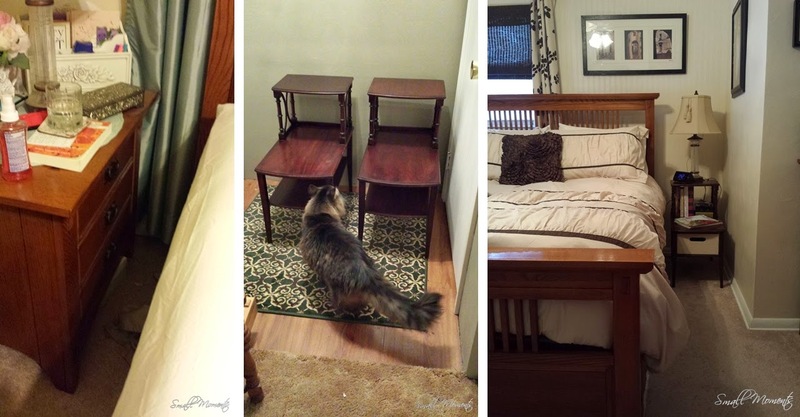 The new nightstands take up a lot less space, and the legs make it feel less crowded. Surprisingly, we actually have more room for more of our stuff than we had on the old ones, which is kind of an added bonus. The window coverings are from Lowe’s. They’re actually the same curtains I have in our living room, except in the dark brown color. 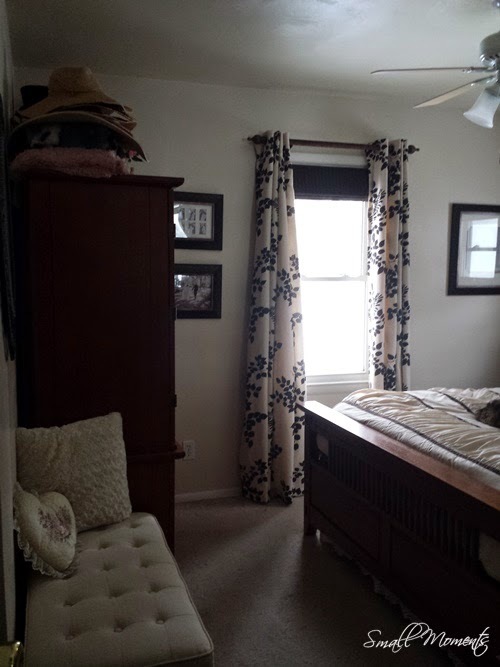 I used full-size flat sheets to line the curtains so they would darken the room. The roman shades were on clearance, and I got them for less than $5 a piece. I love the dark color with the curtains. 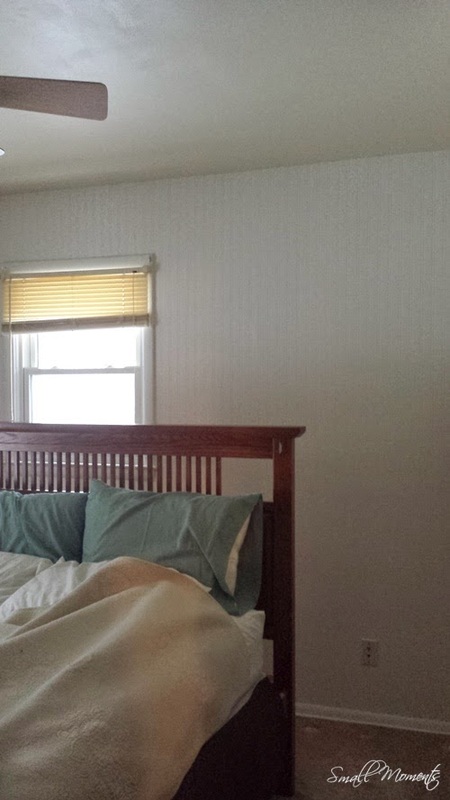 When both the curtains and the shades are closed, not a bit of light gets in the room, which lets us sleep in if want. The curtain rods were quite an odyssey. I was originally going to go with white rods, but the ones I bought were warped, so I took them back. Then I got the idea I wanted dark rods, so I bought some 28″ adjustable oil rubbed bronze rods. The grommets kept catching on them where the two poles connected, so I sent them back. Then I bought some 36″ bronze ones that turned out to be black when they arrived, so I sent those back. Finally, I bought some 1.25″ diameter 36″ wood dowels, some unfinished finials and some brackets, stained them, and made my own curtain rods. I was much happier with them than I was with any of the ready-made rods. 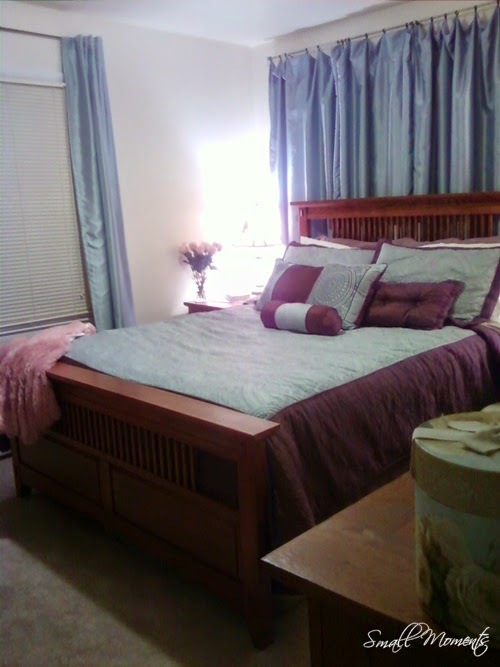 I’ve been focusing on the bed side of the room, so here are some pictures of the rest of the room. Walking in from the hallway. The curtains in the picture are covering my closet. Another view from the window side. Jasper doesn’t even move. 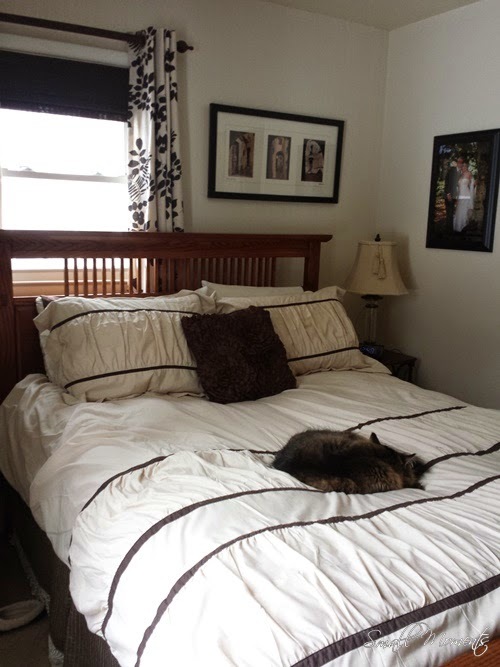 I was going to paint the furniture a creamy white, but once I got everything else painted, the new curtains hung and the new bedding on the bed, I decided I liked the look of the wood. 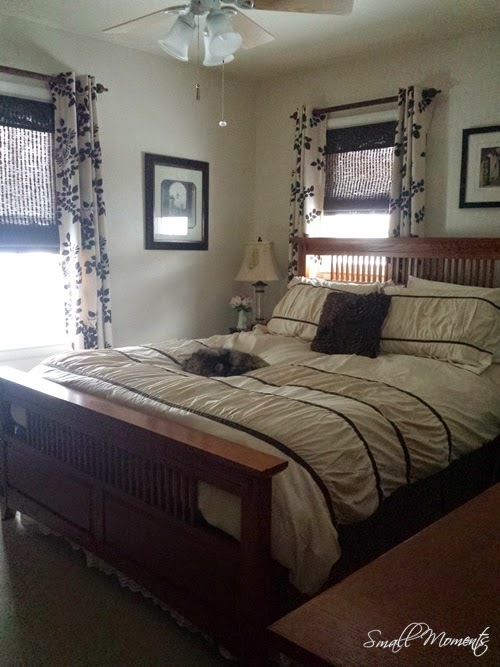 The curtains have dark brown leaves on them, and the stained wood gave the room a very nature-like feeling. Not only that, but it is now a cream and brown bedroom. It needed some contrast to make it come alive. There’s another change I made. 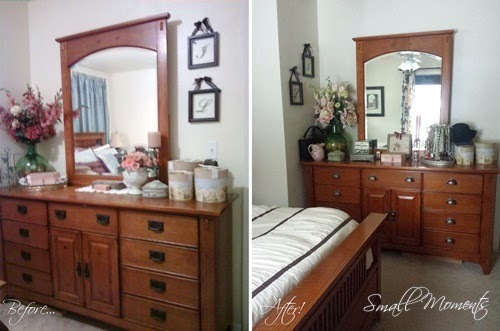 I switched out all the hardware on the dresser and armoire. The old one rattled and clanked every time the drawers were opened and closed, which is annoying when one of you is trying to sleep! It’s not a huge difference in the look… Although, I do think it makes the furniture look less mission style and makes it look a little more elegant. Regardless, it does make it a lot quieter, and that was my real goal! The new bedding really tied the whole thing together. I am so happy with how it turned out. I’m loving how bright the room is and how much larger it feels. 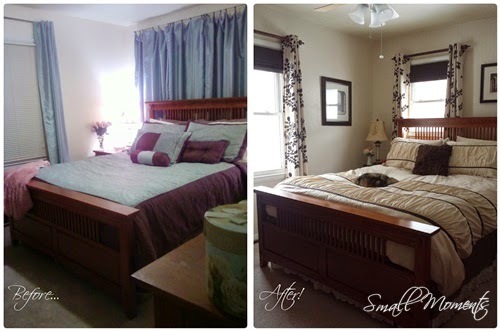 It truly is amazing what new window covering, new bedding and fresh paint will do to a room. I don’t know… Looking at the before, the room kind of looked like your standard hotel room, nothing to write home about. Now it looks and feels like a retreat. Even if it is as small as it was before, it feels bigger, airier and fresh. Would you ever embrace an off-center window or would you try to hide it? Do you have an architectural detail in your bedroom that makes you scratch your head and wonder what the builder was thinking?